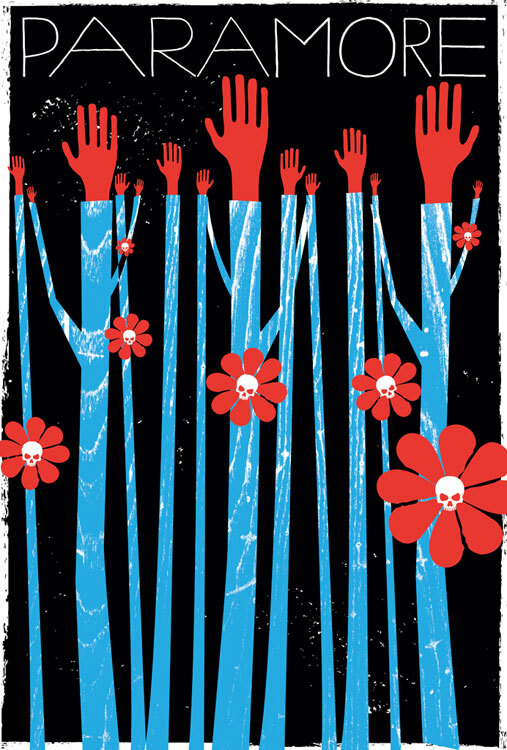 Our new (re)release, "Fair Is Fair Trade" 3-color hand pulled silkscreen art print. Click the above image to purchase or for more info! 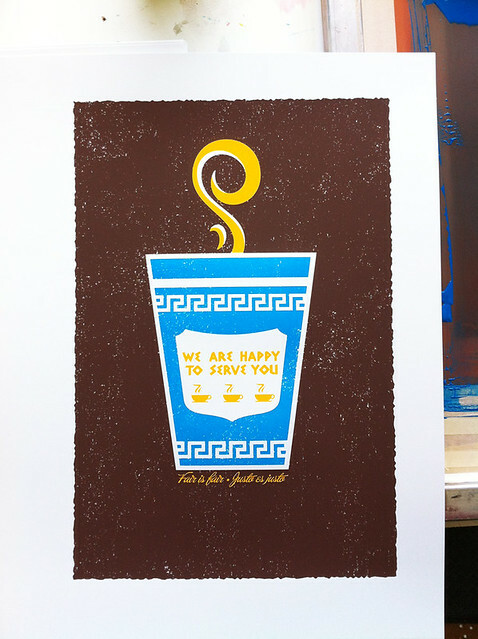 Our new (re)release, "Coffee, Thee & Me" 3-color all hand pulled silkscreen art print. Click the above image to purchase or for more info! Sometimes the dead do come back. Yep! It’s true. There are a few long-sold out art prints that we have been considering bringing back from the archives and we’re happy to announce that 2 of our most requested silkscreen art prints are back in a big way. “Fair Is Fair Trade” was originally designed and printed in 2008, featuring dark-roast brown and an Aegean Blue iconic NYC coffee take out cup with the slogans “Fair is fair. Justo es justo” supporting the freshly poured cup of joe. 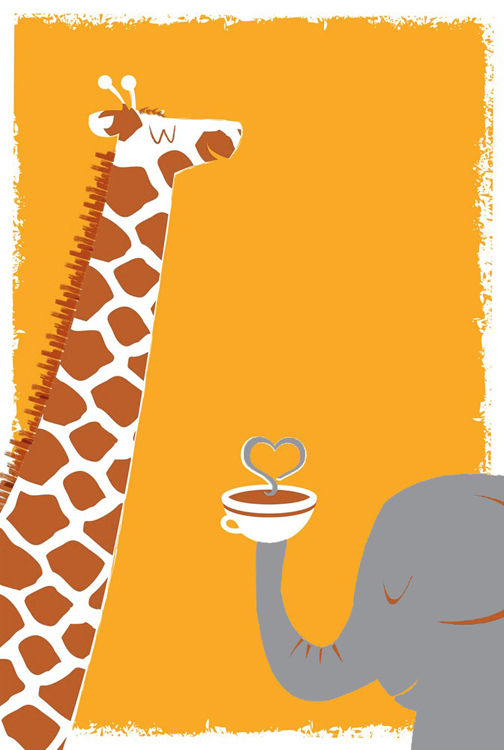 “Coffee, Thee & Me” was originally designed and printed in 2009 featuring and elephant and a giraffe, super best friends sharing a moment of love and fidelity over a steaming cup of fresh coffee. Both coffee-themed screen prints were created as a part of an art show initiative to raise awareness and funds for a fair trade coffee collective which Mugshots Coffee House in Philadelphia, PA works with regularly. Both coffee-forward print runs sold out quickly, and being major coffee fans as well as strong believers in not only supporting fair trade practices, but in putting our money where our mouths are and giving back creatively. To that end, we are really excited to re-release and re-print both designs as open edition art prints with a portion of the sale of each print benefiting Fair Trade USA. Fair Trade USA educates consumers, brings new manufacturers and retailers into the Fair Trade system, and provides farmers with tools, training and resources to thrive as international businesspeople. 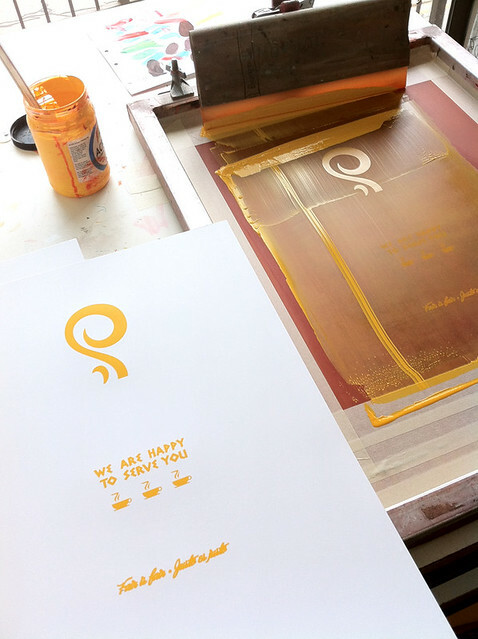 Both “Fair Is Fair Trade” and “Coffee, Thee & Me” are entirely hand silkscreen printed with 3 hand mixed colors and are sized to fit beautifully into either a standard 16″ x 20″ frame by trimming the border, or into an 18″ x 24″ frame as is with a 1″ matte. “Fair Is Fair Trade” and “Coffee, Thee & Me” are now available for purchase from our webstore here in our “Benefit Prints” section where the sale of each item directly benefits a cause or charity that we support, or in our Etsy shop here. 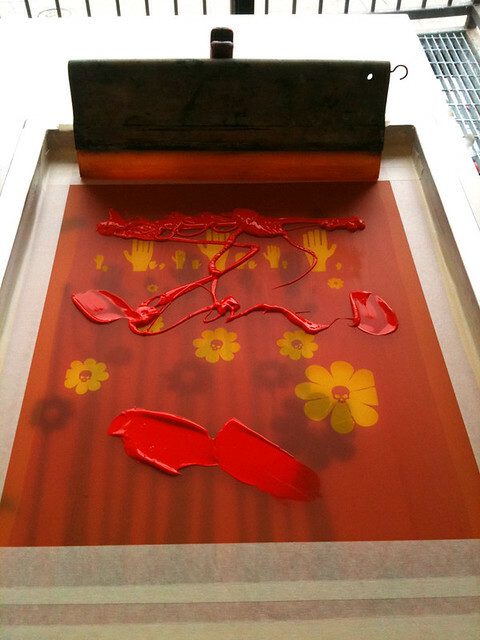 Below are some photographs from the hand silkscreen printing process taken while printing in our studio. There are tons more process photos at our Flickr page here too. 1st color printed "Fair Is Fair Trade". Steam & text. 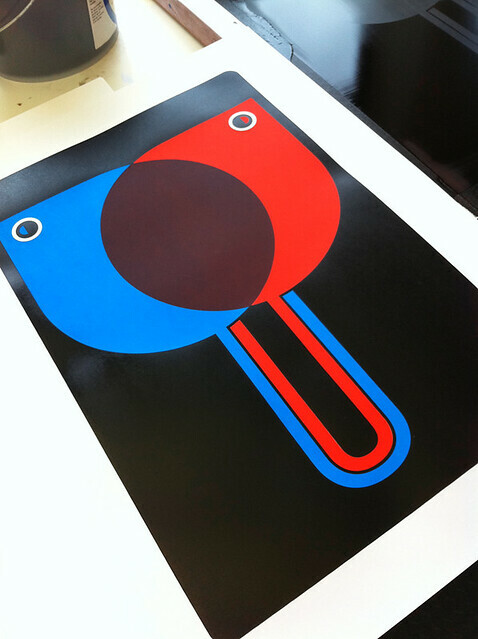 Fancy finger-color tests and the 2nd color, "Fair Is Fair Trade", our 3 color silkscreen art print. 3rd & final color, all done! 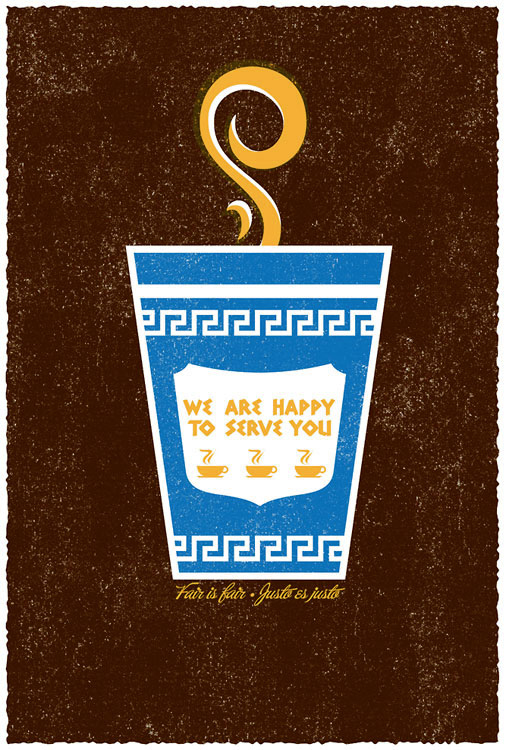 "Fair Is Fair Trade", coffee-themed our 3 color hand screen printed art print. Click the above image to purchase or for more info. 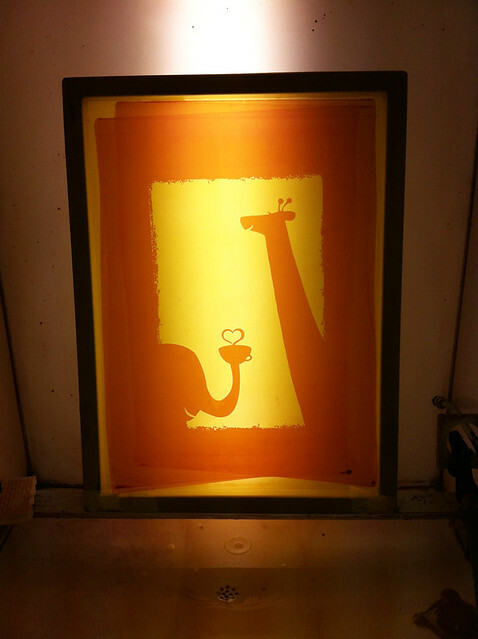 "Coffee, Thee & Me" 1st color screen in the washout booth, waiting to dry. 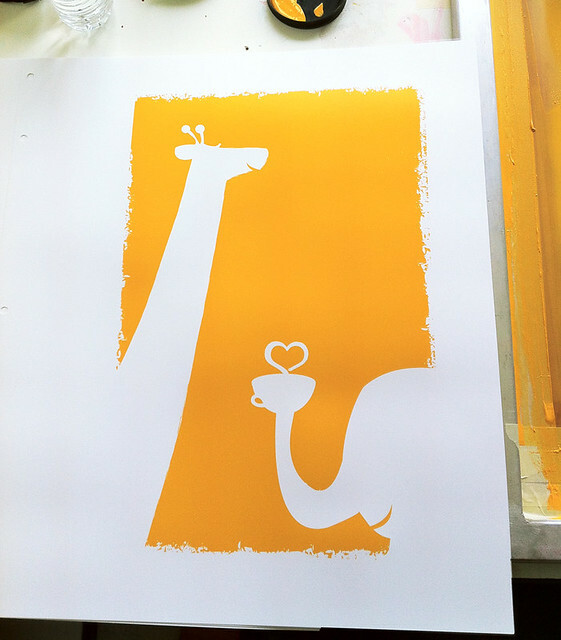 1st color printed on our "Coffee, Thee & Me" hand screen printed art print. 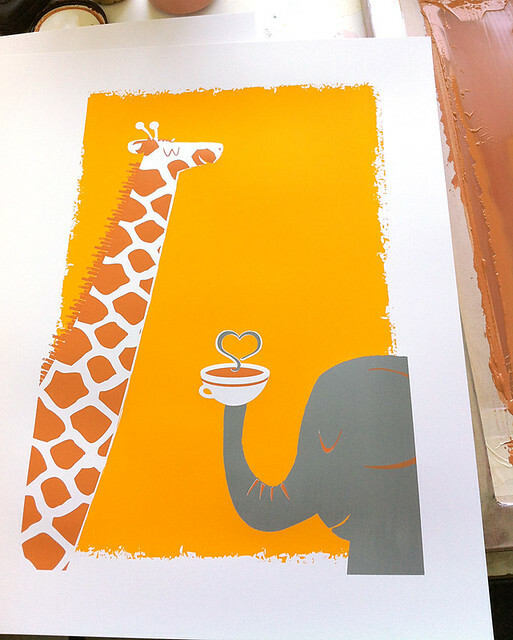 2nd color, elephant-grey, ready to rock on our "Coffee, Thee & Me" hand silkscreen printed art print. All done! 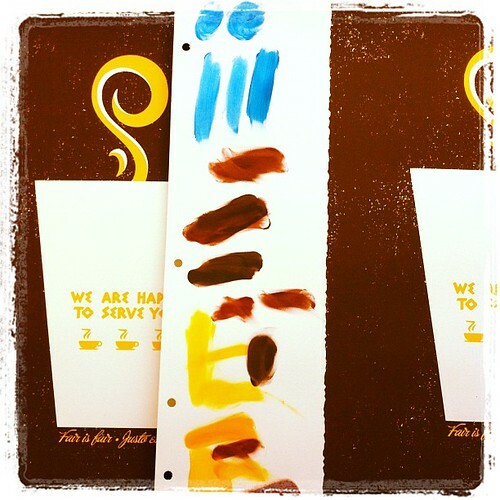 Our 3-color hand pulled silkscreen art print "Coffee, Thee & Me". Click the image above for more info or to purchase. New art print release: Tiger Birds, Moogfest Synth Art Show art print! Hand silkscreen printed 3-color art print, "Tiger Birds", a part of the 2011 Moogfest Synth Art Print Show, now available! Click for more info or to purchase. Tiger Birds, Moogfest 2011 Synth Art Show art print – brand new release! We were super excited to be a part of the official Moogfest Synth Art Print show this year. 15 silkscreen printmaking rock poster artists were invited to create an original print using the space & time twisting sounds Moog as inspiration. What do you see? Is it a panting Tiger? 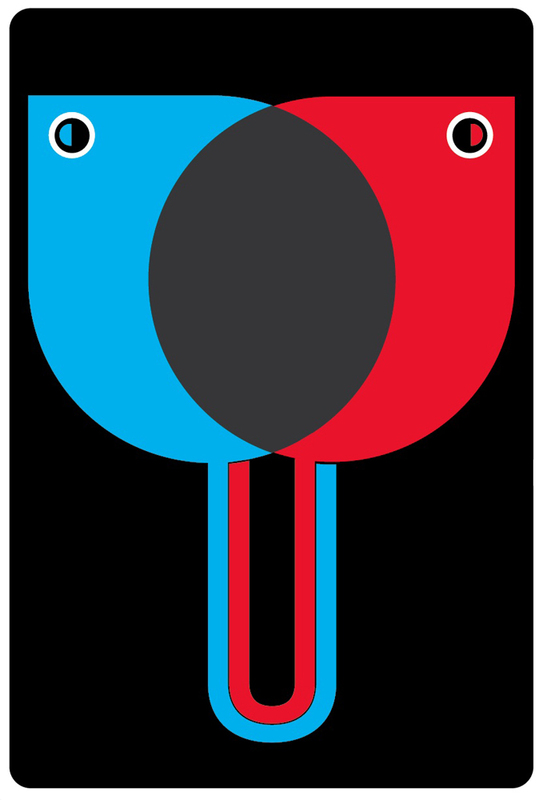 Is it two interlocked birds? It’s both! It’s everything all at once. Grarrr-tweet! 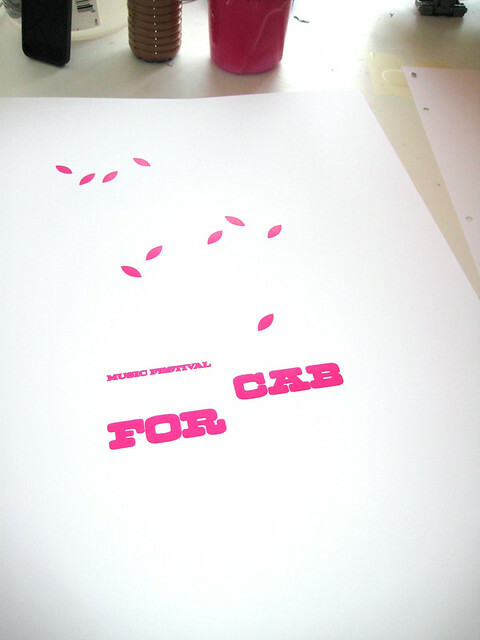 This is our art print for 2011’s Moogfest Synth Art Show, Tiger Birds. Inspired the man and the machine, Moog. The Moogfest Synth Art Show is a super popular event and a part of the incredible Moogfest, happening this year on October 28, 29 & 30, 2011 in Asheville, NC. Moogfest is the annual event that honors the remarkable vision of Robert Moog and his amazing musical inventions that changed the course of music. For more information about the amazing Moogfest click here and for the Synth Art Show click here. Tiger Birds is our all hand silkscreen printed art print with hand mixed Transparent Cyan, Bright Red, and Midnight Black water based acrylic silkscreen inks. Edition of 100. Size: 16 x 22 inches (30.5cm x 30.5 cm.) Paper: no acid, archival Cougar, White 100lb cover weight. Tiger Birds is now available both in our webstore here and also in our Etsy shop here. Dig process photos of the hand silkscreen printmaking process? Check out a selection of photos below, or visit my Flickr stream here. 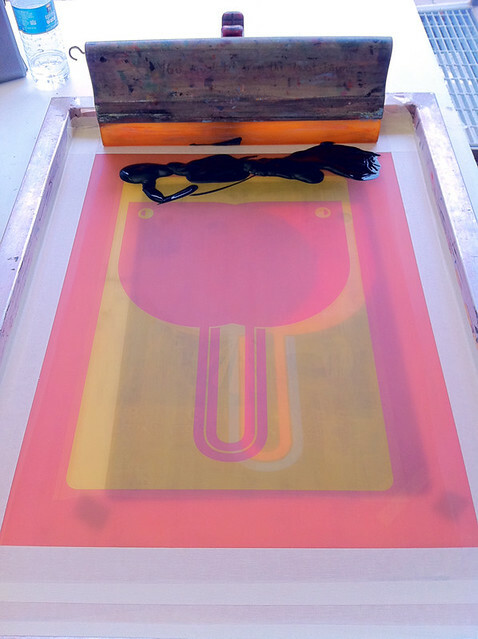 Setting up the first color for "Tiger Birds", our Moogfest art print. Click for more info and more process photos. 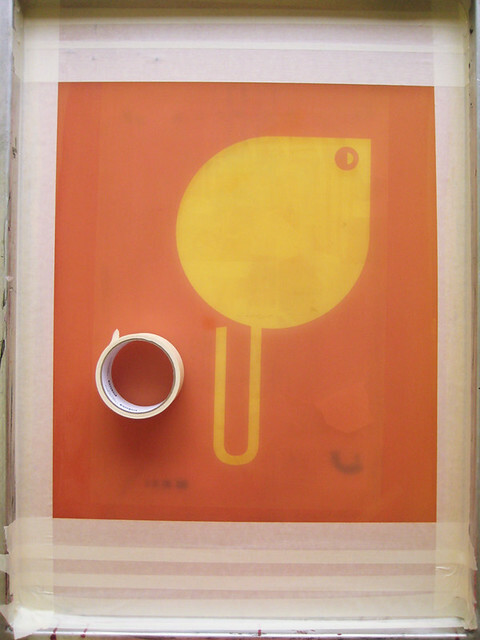 A silkscreen print in the making: 1st color printed, Tiger Birds. Click for more info and more process photos. 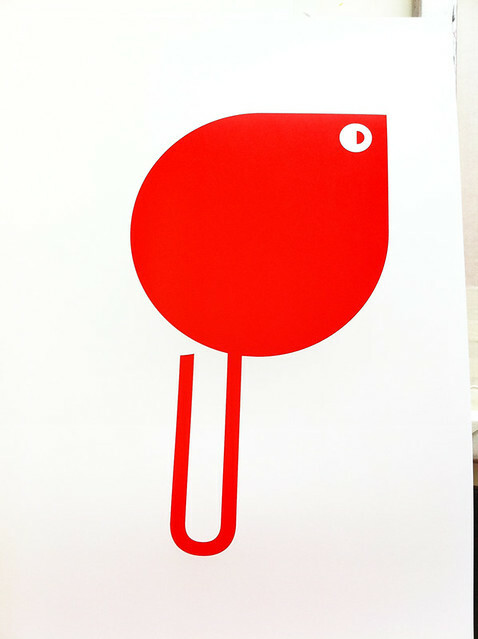 Registering the 2nd color on our new silkscreen print, Tiger Birds. Click for more info and more process photos. 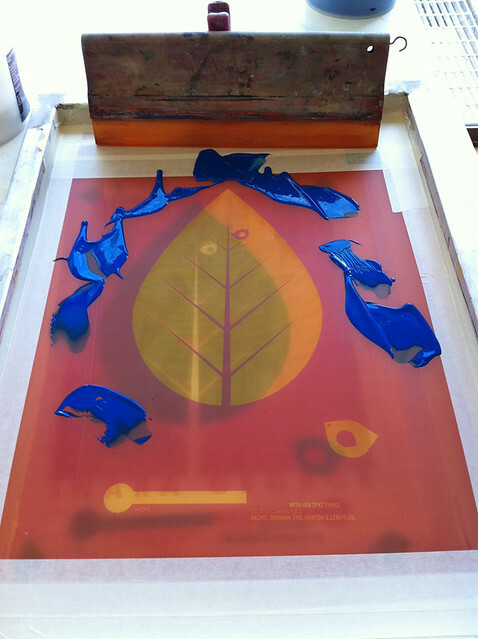 Ready to print the 3rd & final color for our silkscreen Tiger Birds art print. Click for more info and more process photos. All done! 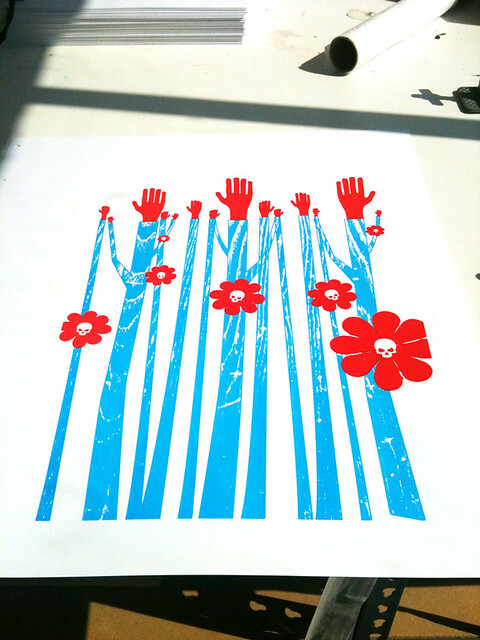 Our brand new hand silkscreen printed art print, "Tiger Birds", for the 2011 Moogfest Synth Art Show. Click for more info and more process photos. 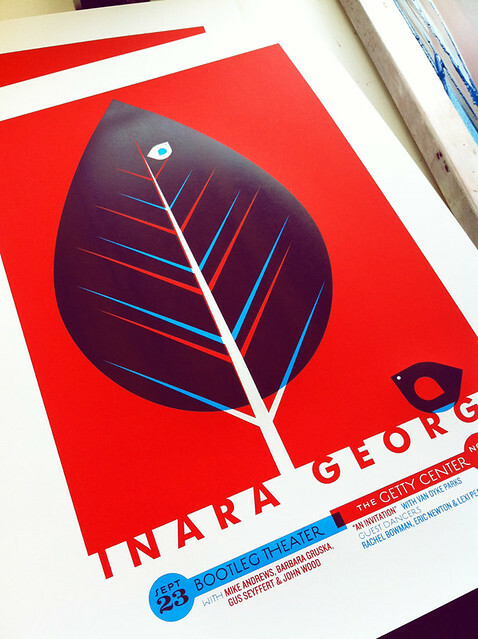 New release: Inara George silkscreened gig poster! 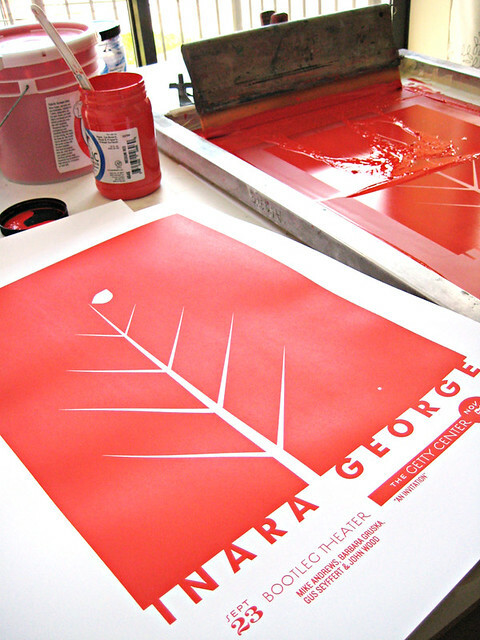 Inara George silkscreen poster: 2 color, all hand printed. Click for more info or to purchase. Brand new releases are always exciting around here. Sure. But I’m *superduperextra* excited this month to share one of the new pieces that we’ve produced for Inara George, of the amazing band The Bird & The Bee, just one of a few new things we’re working on in collaboration with one of our favorite bands around this Fall. This poster is a two-fer print, in a number of ways. First, this hand silkscreen printed poster covers 2 LA shows for Inara George this Fall on September 23rd at Bootleg Theater in and also at the Getty Center on November 5th with Van Dyke Parks. 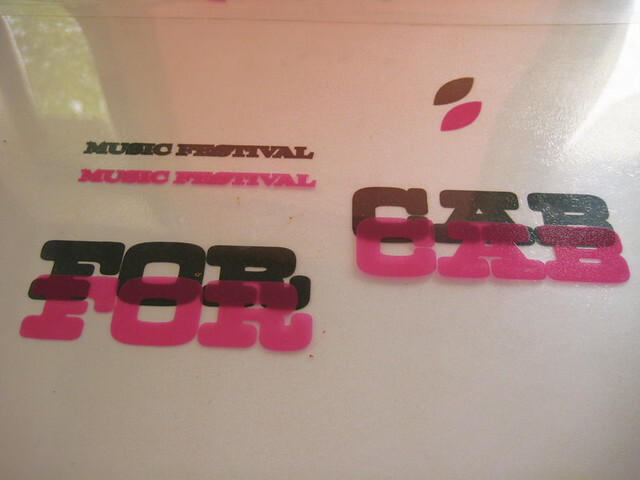 Second, we’ve used tricky overprints to get 3 bold colors from 2 screens. That’s our way! That’s what we love. We hope that you do too. Simple, sweet but not always straightforward and deceptively complex. Hand silkscreened poster for 2 shows for the incomparable Inara George of The Bird & The Bee. Mid-century throwback style always seems fresh, just like the lady herself. This is our all hand silkscreen printed poster for Inara George with hand mixed scarlet red and transparent cyan water-based acrylic screenprinting inks. Edition: 50, each of these limited edition posters are signed & numbered (by me, strawberryluna) Size: 16×22 inches (39.4 cm x 55.9 cm.) Paper: archival Cougar, White 100lb cover weight. This poster will also be available on tour and at shows with Inara George throughout this fall, and especially her show at The Getty Center on November 5th, as well as also from my website here and also in my Etsy shop here. 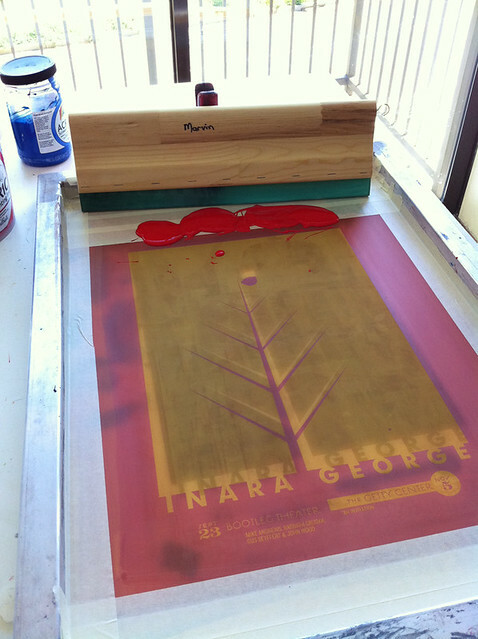 1st color ready to print for our Inara George poster. Click for more details & process photos. 1st color printed, screen flooded for more! Click for more details & process photos. 2nd color ready to rock. Click for more details & process photos. All done! Fresh off the press and still glistening, our Inara George hand silkscreen printed poster. Click for more details & process photos. New 4-color, silkscreen printed art print "Elephants Never Forget", click for more details or to purchase from my website. Hooray! I finally had the chance to print a new art print that I’ve been wanting to do for a long, long time. Introducing our new “Elephants Never Forget” hand pulled silkscreen art print. Sharp-eyed strawberryluna aficionados may recall a similar illustration from a poster for Xiu Xiu from way back in 2006. 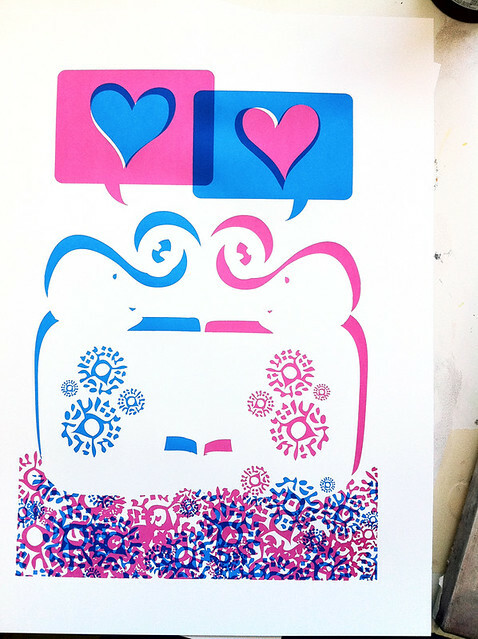 We still liked these two so much, we brought them back to life in a new hand pulled silkscreen art print. Freshly available for purchase here at my website and also in my Etsy shop here. Elephants really don’t forget a thing. And when you’ve found your perfect match, what’s to forget? Fall in love, stay in love. It’s simple! They are amazing and noble creatures. I think they are perfect to symbolize the “forever” part of being in love. 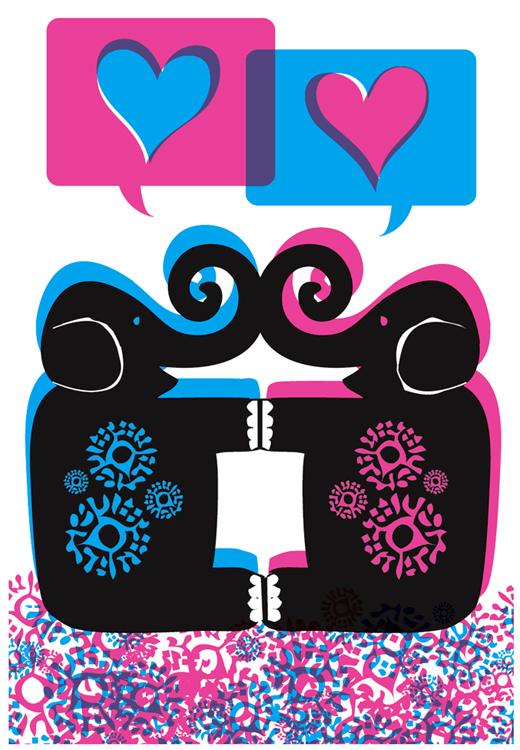 Elephants Never Forget is my 4-color, all hand screenprinted love forever art print with hand mixed Cyan, Magenta and Black inks. 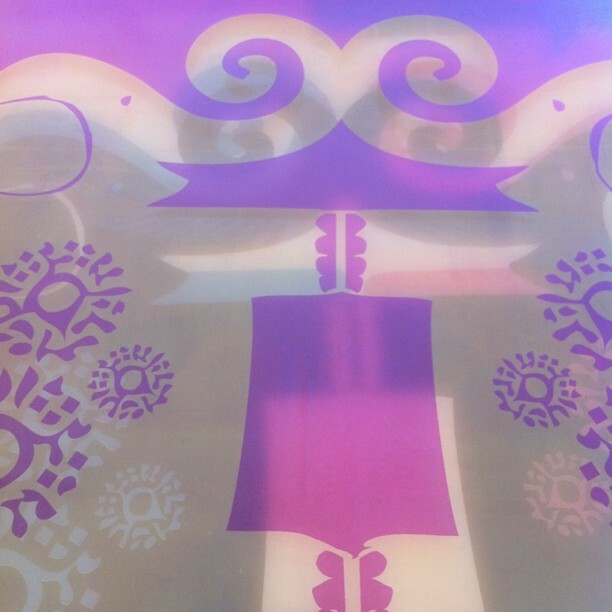 Super fun overprinting layers of ink make a soft purple where Magenta & Cyan overlap. Magic! Edition of 200. Size: 16 x22 inches (39.4 cm x 55.9 cm.) Paper: no acid, archival Cougar, White 100lb cover weight. 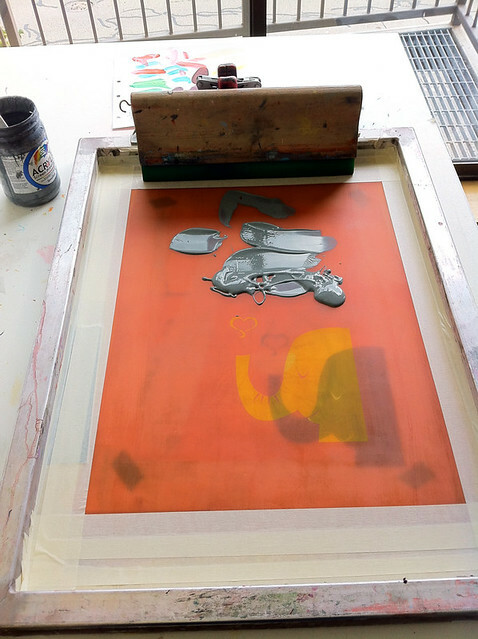 Additional photos below are from my studio during the hand silkscreen printing process. Click any image below to see more process photos in my Flickr account too. 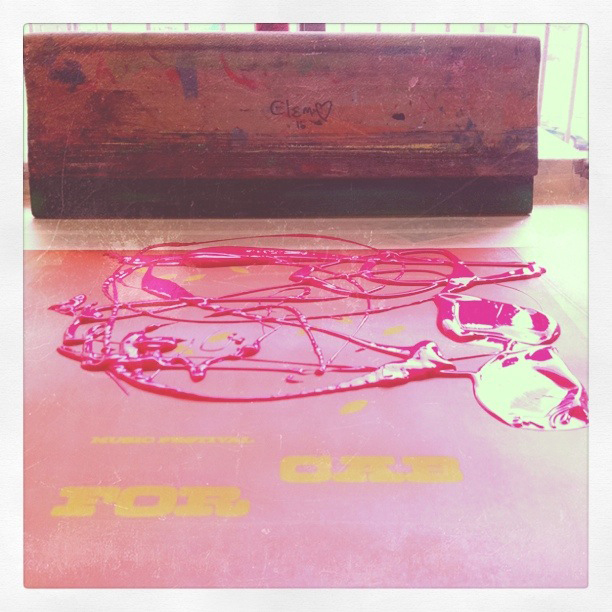 1st color (Magenta) ink waiting to be printed. 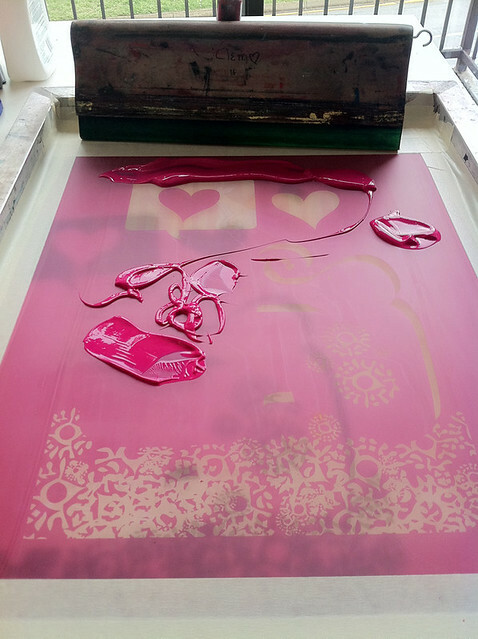 Click to see more screen printing process photos. 2nd color printed, overprint fun! 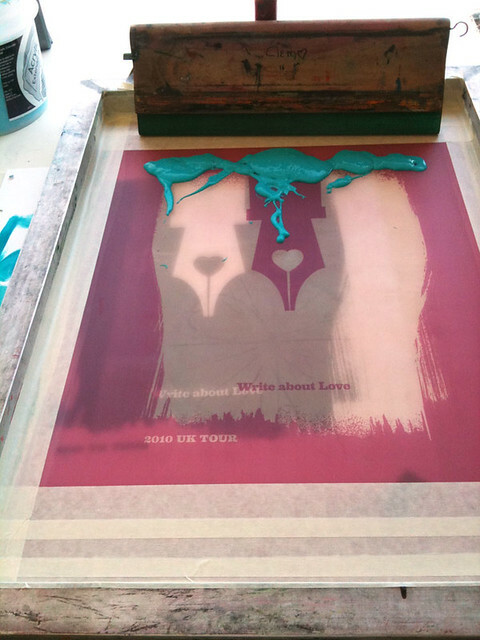 Click for more screen printing process photos. Elephants peeking through the screen. 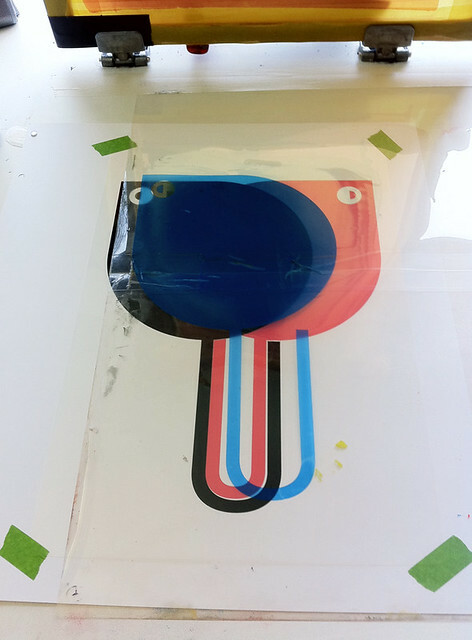 Click for more details & silkscreen printing process photos. All finshed! 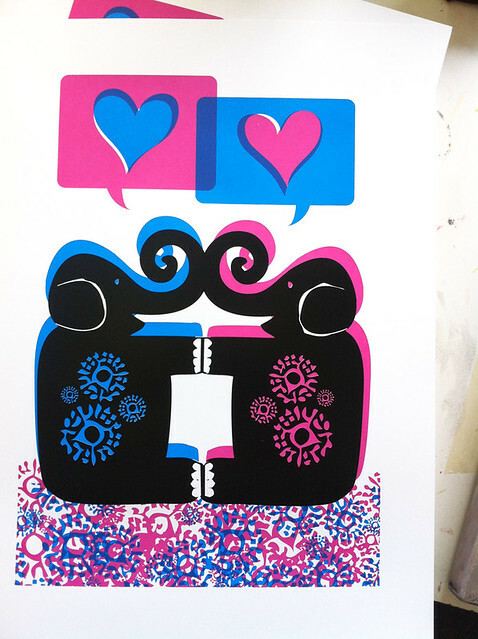 New 4-color "Elephants Never Forget" hand silkscreen printed art print. 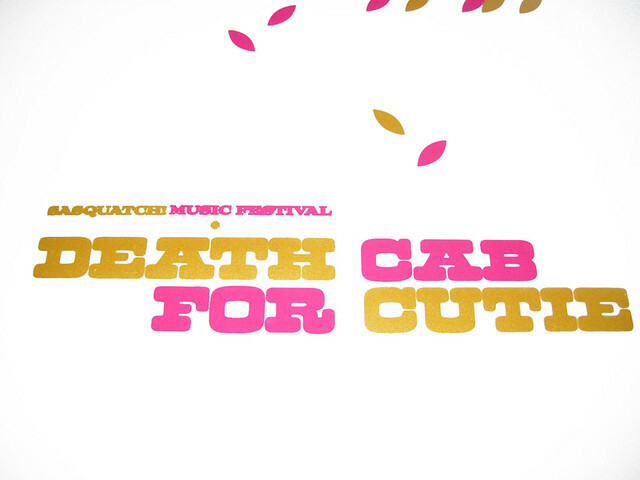 Death Cab For Cutie: New poster released! Fresh off the press! 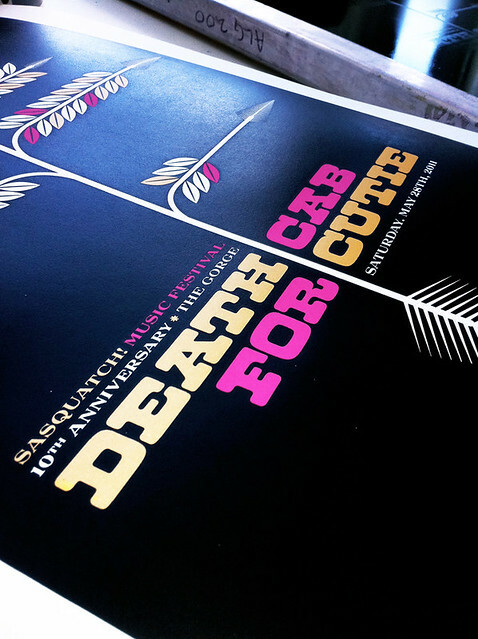 Death Cab For Cutie, 3-color, limited edition hand silkscreen printed poster for their Sasquatch Festival show. Click to purchase or for more info. The newest of the new? 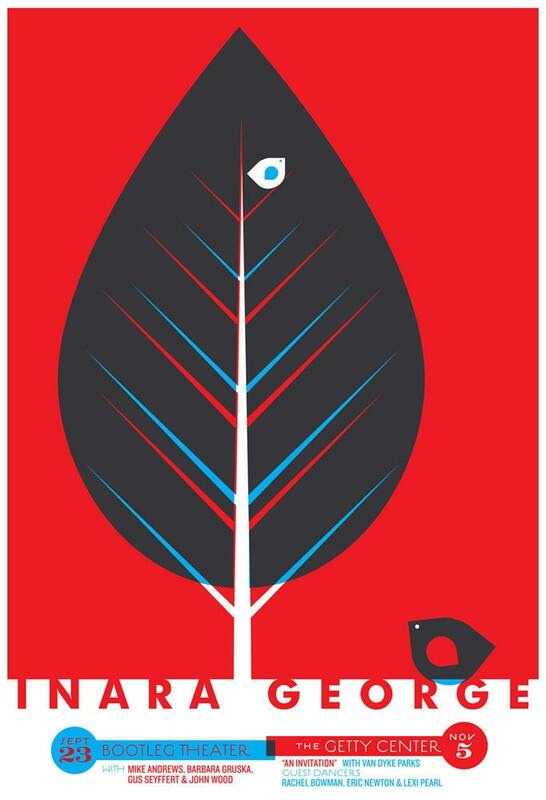 Our new poster for the superfantastiche and always dang great, Death Cab For Cutie. All hand silkscreen printed, limited edition and a part of the legendary Sasquatch! Music Festival poster series, commissioned each year by Sasquatch! and representing the top poster artists working today. We’re thrilled to have been asked to participate for the 5th year in a row in this series. What can we say? Bright & dark, sharp and open, all at the same time. Death Cab For Cutie is one of those bands that perennially seems to be at the top of their game, record after record, song after song. This is our all hand silkscreen printed poster for the sonic & lyrical perfection the one & only Death Cab For Cutie with hand mixed midnight black, magenta, and metallic gold acrylic screenprinting inks. Edition: 150, each of these limited edition posters are signed & numbered (by me, strawberryluna) Size: 16×22 inches (39.4 cm x 55.9 cm.) Paper: archival Cougar, White 100lb cover weight. Freshly available now in my webstore here, and also in my Etsy shop here. Below you’ll find a few selection of process photographs taken during the hand silkscreen printing process, click any of the below for more info and more photos in my Flickr account. 1st color ink on screen & ready to go. Click for more photos & more info. 1st color registering. Click for more photos & more info. 1st color printed. Click for more photos & more info. 2nd color, (gold!) printed. Click for more photos & more info. All done! 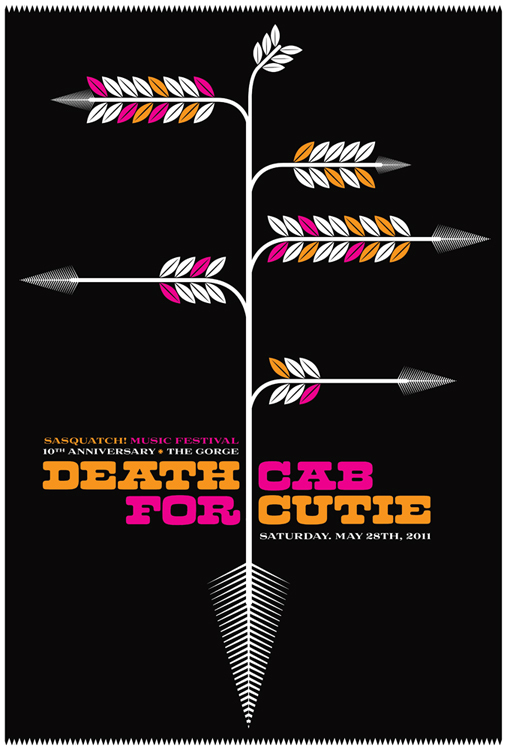 Death Cab For Cutie 3-color all hand silkscreen printed poster. Click for more info or to purchase. Click to purchase or for more info. We’re mega excited about this one around here! 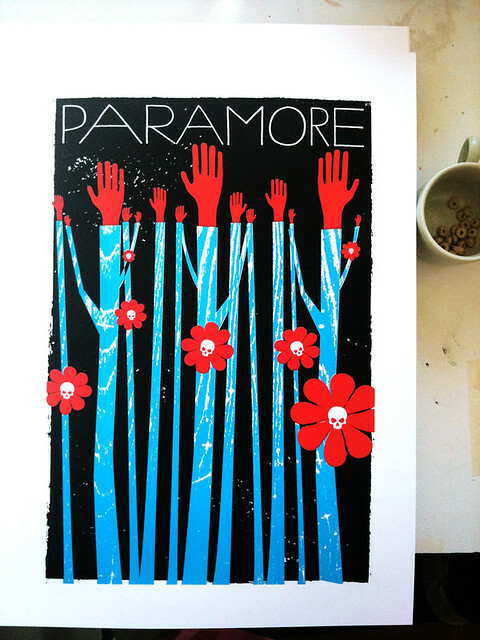 Introducing our all hand silkscreen printed, limited edition poster for Paramore for their 2011 Tour. The darker side of Spring exposed for the band Paramore here in our poster for them. We’re so stoked working with these guys on a Spring 2011 poster. All things grow in Spring, but all things may not always be what you expect. Dark, sweet, and sharp. That’s the allure of Paramore. Available for sale at my website here and also in my Etsy shop here, this my all hand screenprinted poster for Paramore with bright blue, midnight black and scarlet red hand-mixed acrylic silkscreen inks. Edition: 300 to the band (look for them on tour and from their website!) and an Artist’s Edition of only 50 posters is available for sale here. All 350 limited edition posters are signed & numbered (by me, strawberryluna) Size: 16×22 inches (39.4 cm x 55.9 cm.) Paper: archival Cougar, White 100lb cover weight. Are you a Paramore Superfan? They you will love what they’ve done that’s all rad and high tech with their copies of our poster. Oh yeah! The future is here. Only at the Paramore webstore, each poster includes a QR code on the back that will take you to a website with three options for mobile wallpapers that feature three unreleased photos of the band. The QR code can only be scanned by those who have a camera phone with a barcode reader and internet connection on their phone. And for you printmaking nerds (and I hope that you are, like me!) check out some process photos in my Flickr account too! 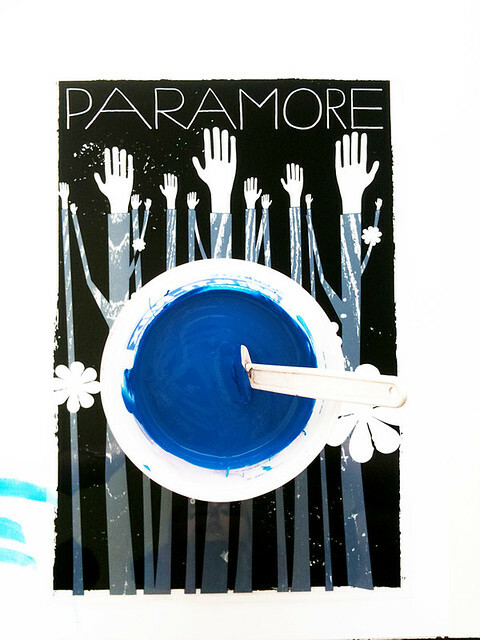 Mixing ink for our hand silkscreen printed Paramore poster. Click for more info. 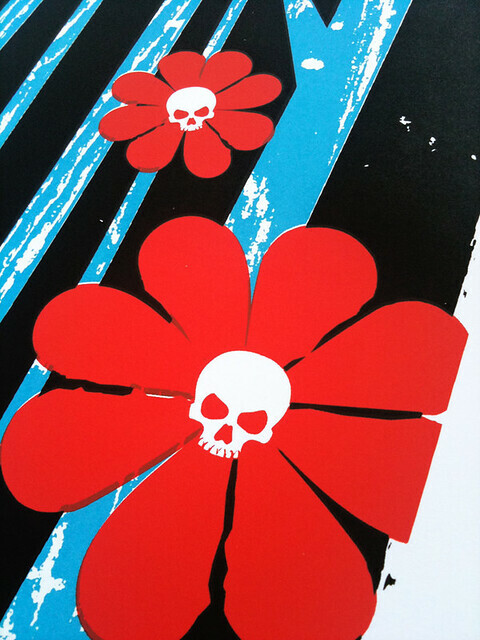 Printing red skull flowers for our Paramore poster. 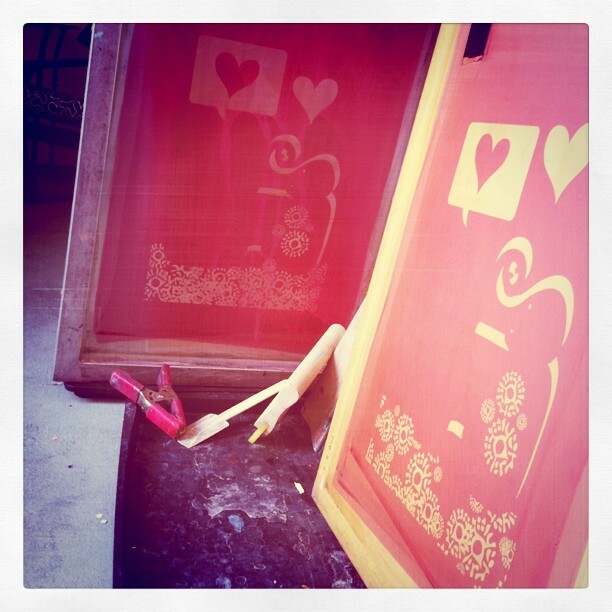 Click for more photos of the hand silkscreen printing process. Paramore hand silkscreen printed Tour poster, 2nd color. Click for more info & more process photos. Detail show of our hand silkscreen printed Paramore Tour poster. Click for more process photos and details. All done! 350 prints later, this is our all hand silkcreen printed Paramore tour poster. Click for more info and process shots. 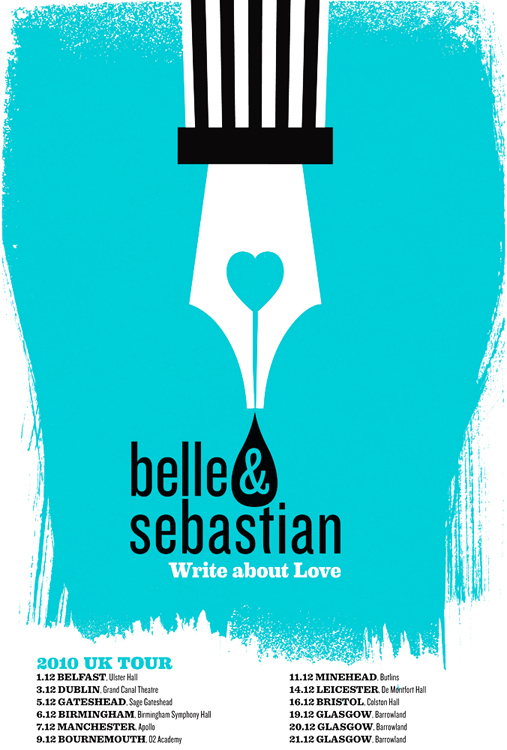 New poster released: Belle & Sebastian, UK Tour poster! Huge big yay! So excited yet again, we just can’t help it. Belle & Sebastian are pretty much my favoritest favorite band, and have been for well close to 15 years. So, we’re beyond-all-reason-honored and thrilled to have been able to design and hand screenprint their limited edition 2010 United Kingdom Tour promotional show poster (our 4th poster for the lovelies from Glasgow). Simply put? They’re the bestest. 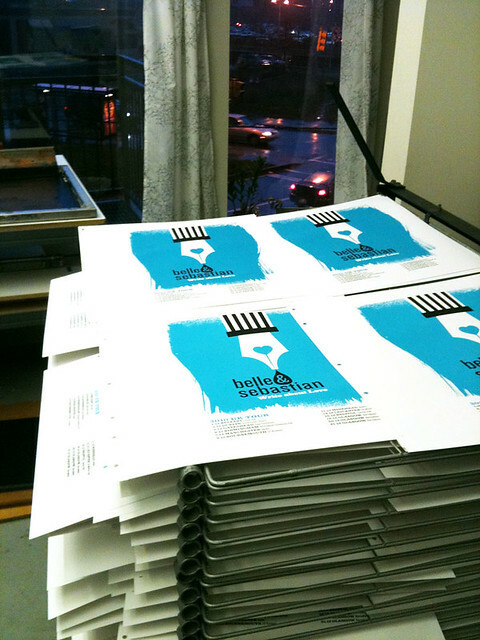 This time we did a blue companion poster to our North American Tour Poster (See it HERE) and the start of a love letter is my all hand screenprinted poster for the fantastic Belle & Sebastian with peacock blue and midnight black hand-mixed acrylic silkscreen inks. An Artist’s Edition of 100 is available here, and are signed & numbered (by me, strawberryluna) so I will have a limited few available for sale. Size: 16×22 inches (39.4 cm x 55.9 cm.) Paper: archival Cougar, White 100lb cover weight. This poster will be available at shows on the UK tour dates, and here as I have just a portion of the run available for sale here, so they will go quick! Now onsale & available for purchase from my website & webstore here and also available at my Etsy shop here. And lo! 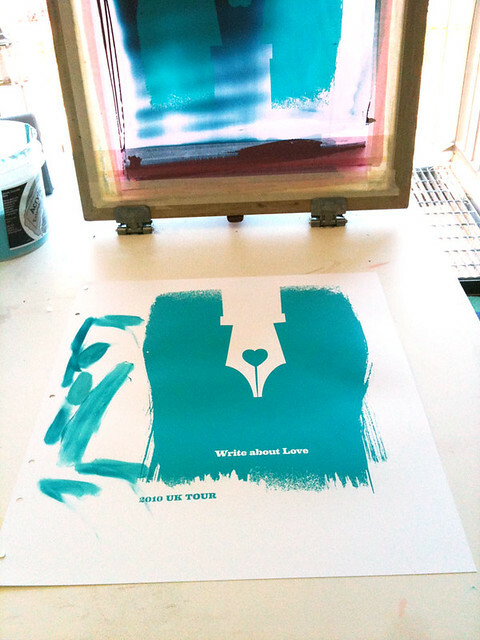 A few process photos are below, taken while hand screenprinting this poster. Click on any of the below images to see larger versions and more at my Flickr account.